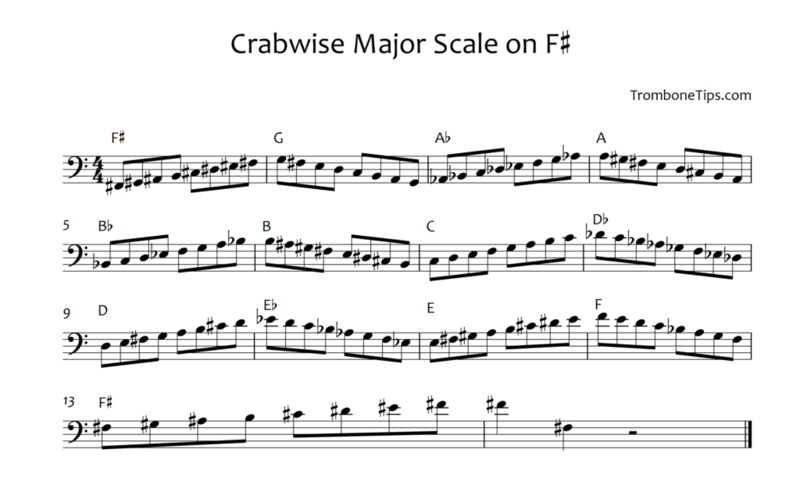 I find these crabwise scales really help with scale familiarity because they really make you think about the notes you’re playing before muscle memory starts to kick in! Practising your scales can be a bit of a chore, but here’s a quick tip to play through them all in a slightly more interesting way than you might be used to. These patterns are also useful to learn because they appear on many exam syllabi and music college/conservatoire technical exams. 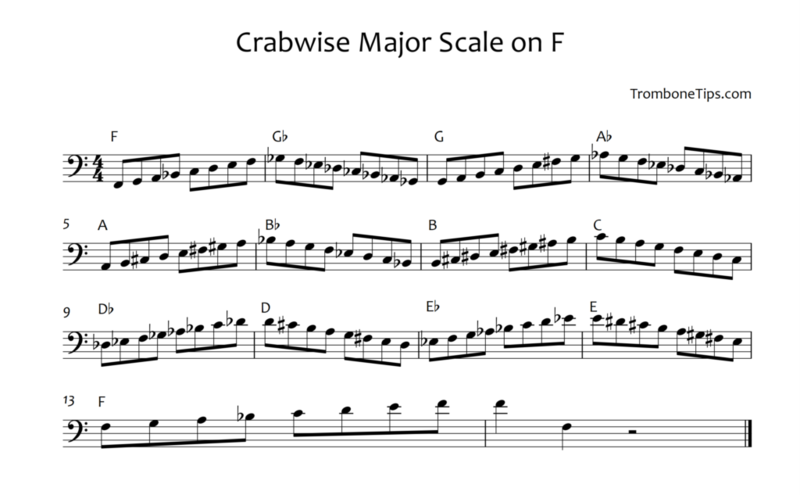 Crabwise scales involve playing a scale up and down, but changing the scale by a semitone every time you change direction. So for example, you go up in C, down in Db, up again in D, down in Eb etc. After playing through both of these, you will have covered all 12 major scales up and down – and with a bit of practise you can do it really quite quickly! This also makes a great warm up once you add some articulation. Try staccato tonguing on the way up and legato on the way down, then switch it. These can be started on any note, I just chose F for the examples because it fits well into the range of most lower (and upper if taken up the octave) brass. Bass trombonists can get a valve workout by starting on pedal Bb – and starting that low you could also do 2 octaves before changing direction for a challenge. Invent your own patterns, change up the articulation – but most of all have fun. Hope this tip helps those of us that are less scale inclined, and gives the sad ones like me some new ideas to torture themselves with! Scales are an important part of every musicians training and form the basic building blocks of most music. Despite being a crucial part of grade exams, easy marks are often lost due to poor preparation of scales. In this lesson we will learn how to play the A minor scale on trombone. Scales are an important part of every musicians training and form the basic building blocks of most music. Despite being a crucial part of grade exams, easy marks are often lost due to poor preparation of scales. In this lesson we will learn how to play the Ab (A flat) minor scale on trombone.